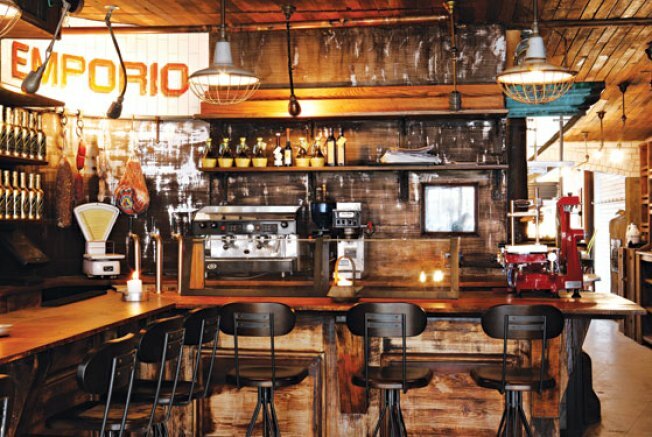 The Aurora crew has gotten even more old-timey rustic Italian with Emporio. Eating in the garden at Aurora in Williamsburg is kind of like being in heaven — if heaven were designed by a native-Roman restaurateur and served gnocchi and red wine in balloon glasses. Mr. Villa, who has also owns the Aurora in SoHo, has created a more casual market vibe (also reminiscent of his homeland) with his new trattoria, Emporio, opening Friday. The décor (pics are here) is reminiscent of a ‘20s era Roman grocery (complete with the option to pick a few things up for the house coming soon). The menu features wood-fired pizzas, pasta made on the premises using organic eggs and locally raised, grass fed meats. (Thrillist has the full menu; though some apparently got cut off in the scanner — but you'll get the idea.) Many of the products used in the menus creation are also for sale, and for the next week or so, while they are waiting for their liquor license, be sure to BYOB a nice hearty red (you have a couple weeks). This is all good news, but none of it goes toward explaining why heaven does not, in fact have gnocchi.